Home / News / Philippines / 50 years after, why is NPA still waging war? 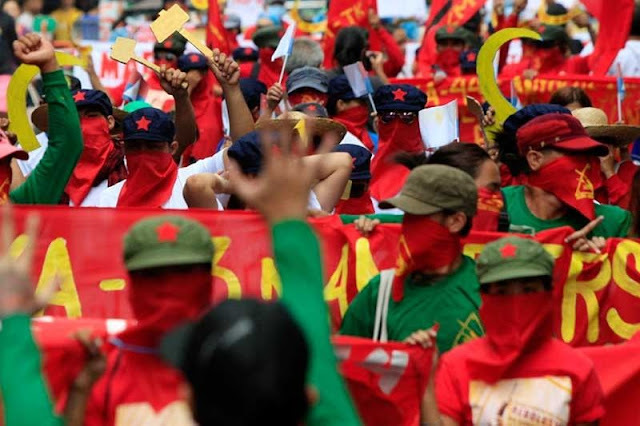 MANILA -- A group of former rebels on Friday questioned the motives of the communist movement and its leaders in prolonging the armed struggle despite the country's substantial development and progress. “Wala nang gulo, bakit gumagawa ng ikakagulo? Ang 50 taong digmaang sibil ay gusto pang pahabain ng mga komunista (There is no more chaos, why are they still fighting a war? It seems they are eager to prolong the 50 years of civil war),” said Ka Dario Bolivar, spokesperson and leader of La Liga Independencia Filipinas. The group, consisting of 300 former rebels, picketed at the historic Don Chino Roces Bridge (formerly Mendiola Bridge) in Manila to call on Filipinos to reject the so-called idealism being peddled by the Communist Party of the Philippine (CPP) and its armed wing, New People's Army (NPA). The group was joined by other anti-communist organizations, including Liga Maralita, Youth Power Against Destabilization and Terrorism, Sambayanan, and Kilusan para sa Pilipinismo. “Mas minabuti pa ng NPA na magkaroon ng digmaan kesa mag usap sa lokal na antas. Karamihan sa ugat at kadahilanan ng rebelyon ay naka ukit sa mga lokal na sitwasyon (The NPA chose to have a war instead of negotiating peace at the local level. Most of the problems that they are fighting for are in the grassroots level),” Bolivar added. Meanwhile, the Armed Forces of the Philippines (AFP) spokesperson, Col. Noel Detoyato said the 50-year struggle is nothing but a failure. "CPP-NPA’s 50-year rebellion is an utter failure as it only resulted (in) loss of lives and destruction to properties. If there is anything significant to the CPP-NPA’s existence, it is the 50 years of violence, injustice, atrocities, deceit and lies,” Detoyato told the Philippine News Agency (PNA) on Thursday. He added that the communist movement continuously hampers the peace and development in some areas of the country. “The leaders, members, and supporters of the communist terrorist group should be ashamed of themselves for bringing years of hardships and misery to our people," Detoyato said. It was also earlier reported that the communist rebels are raking in millions of pesos extorting money from candidates especially during elections. Detoyato, meanwhile, also called on Filipinos to help the government in putting an end to the decades-long violence of the communist movement. "Let us unite in encouraging our misled brothers and sisters in the CPP-NPA to end the armed struggle and embrace the path to peace," he said.